One of the reasons people love Halloween so much is because they get the chance to be someone else for a night. Choosing your costume has always been and will always be one of the best parts about the holiday. In many ways, Halloween is the ultimate champion of the child’s imagination. The way that we celebrate and encourage dressing up and playing make-believe is like a collective agreement from everyone that it’s cool to be a kid. Stillwater the giant panda is the recurring star of the Zen series by Jon J. Muth, and he always has beautiful and thought-provoking stories to tell to his friends. In Zen Ghosts, Stillwater tells an ancient tale of a young couple in love. Unfortunately, they must flee their home if they want to stay together, because the young girl is promised to another man. I won’t give away what happens to the couple after they flee, because the ending simply must be experienced while reading. The tale of the lovers that Stillwater tells comes from a Chinese Buddhist monk and dates back to the 13th century. I whole-heartedly agree with the author when he writes “it raises the hair on the back of my neck whenever I hear it.” It’s a tremendous tale of love and a very appropriate story for a Halloween book, but never in a million years would I have made the beautiful connection to Halloween and the masks that we wear that Jon J. Muth does later in his author’s note. I’m a big fan of books that lead to interesting and meaningful conversations with my children after reading. I really appreciate author’s notes that are full of questions that can accompany the text. 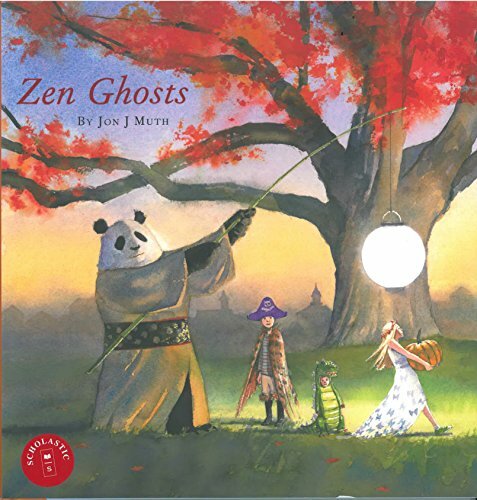 Some children’s books are full of life lessons and advice for being a better and more-caring person, but Muth’s Zen books always have a different kind of lesson. They always teach children to be thoughtful and reflective about the workings of their own minds. In Muth’s opinion, Stillwater’s stories are questions you have to answer for yourself. You can’t think them through or intellectualize them. I wanted to offer this story to children because at a very young age we discover questions about duality. There is the me I am with my parents, the me I am with my friends, and there is still another me with a different group of friends. I am my mother’s son when I am with her, but am I not also my mother’s son when I am with my friends? Do I act differently? What if they want me to do something my mother’s son would not do? Am I being dishonest with someone? With myself? When our hearts are taken in two different directions, where are we? As you can imagine, this is a very intriguing concept for a 6-year-old to process. When we read this paragraph out loud to our son, I could tell it made him stop and think about the implications of having various selves. As Muth points out, it’s the kind of story that leaves you with more questions than answers. But as a parent it’s almost a tragic concept, because it forces you to acknowledge the effect that other people will have on your children, and the potential that there will be versions of them that you never meet. Talk about a scary story. 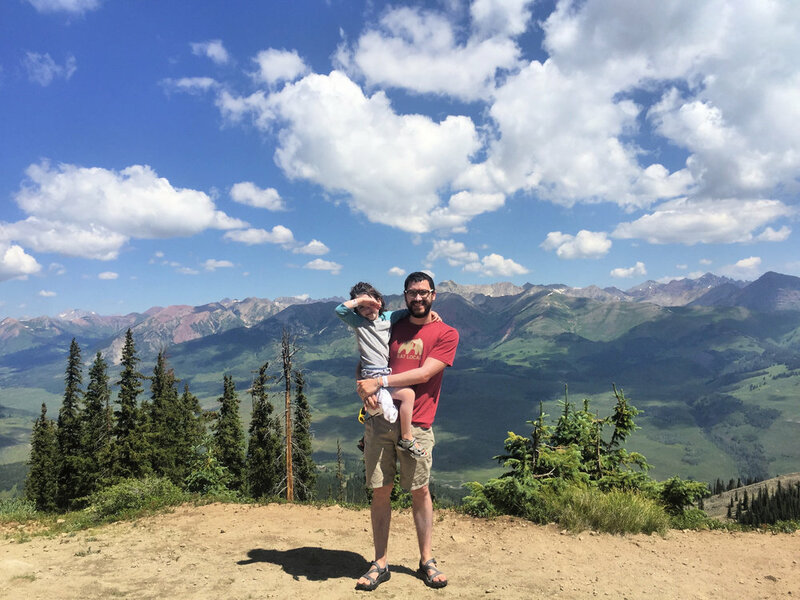 As parents, the best we can do is to prepare our children for life and the tough choices they will inevitably face. Zen Ghosts very subtly offers quite a bit of life preparation for a Halloween story. Children can walk away inspired to be who they want to be, like Michael the Owl-Pirate. They’re encouraged to do whatever it takes to chase their love like the young lovers in Stillwater’s tale. And they’re asked to consider the complex implications of acting like somebody you aren’t, and why someone might make that choice. It’s fair to say that Stillwater’s stories and lessons are always the highlight for me in the Zen books, but that’s certainly not the only thing to love here. Muth’s watercolors are jaw-dropping. Zen Ghosts contains two of the most beautiful Halloween drawings I’ve ever seen - one is in the endpapers and the other is a two-page spread of trick-or-treating. I honestly would have paid the full price of the book for a single print of either of them. They’re gorgeous and they perfectly capture the spirit of Halloween that I love. I always walk away from a Zen book happy. The art is beautiful and peaceful. Reading them is always soothing and insightful. And I am immensely grateful that Jon J. Muth decided to let Stillwater the giant panda tackle my favorite holiday. Does your family love Stillwater as much as we do? Have you read Zen Ghosts yet? Have you ever used questions from this or any book to start a good conversation? Let us know in the comments!